Sometimes Christians get into situations which seem overwhelming, leading us to feel bad both for the situation and for not seeming to measure up to our Christian calling. 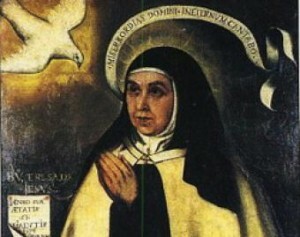 St. Teresa of Jesus, also called St. Teresa of Avila, underwent a similar experience. St. Teresa is known for being in the highest union with God in prayer, and her writings on the mystical life serve as an inspiration for the many of us who never hope to achieve the vision of God until heaven. As a young girl, she entered a cloistered convent to dedicate herself to prayer and community life. This life was very good for her, and she developed greatly in the spiritual life. At the age of 45, though, she felt called to leave her comfortable life behind in order to found reformed monasteries which would even more closely model the life of Jesus our Saviour. Despite great challenges from society and her fellow sisters, St. Teresa spent the last few decades of her life reforming local monasteries and founding new ones where the sisters were both powerful and deeply spiritual. As Christians we feel that we should react positively to all challenges in life, but still we become overwhelmed sometimes. This is a natural reaction to situations which are challenging, and would be overwhelming to almost everyone, even people who live the faith with the greatest spirit of dedication to God. So we should not feel bad when beset by difficulties, instead we should persevere, knowing that God loves us and gives us the grace to overcome, and perhaps even find humor in our struggles as did St. Teresa. Lent is a time to learn the grace of perseverance, so wonderfully embodied by St. Teresa. It is a time to train to overcome overwhelming situations. As we make little sacrifices daily during Lent, we come to realize that we have become able to face greater sacrifices as they are thrust upon us. So, if you feel overwhelmed, know that God will give you the courage to overcome. If you are merely annoyed by Lenten practices, know that any preparation in the life of grace will help you on the road to holiness.